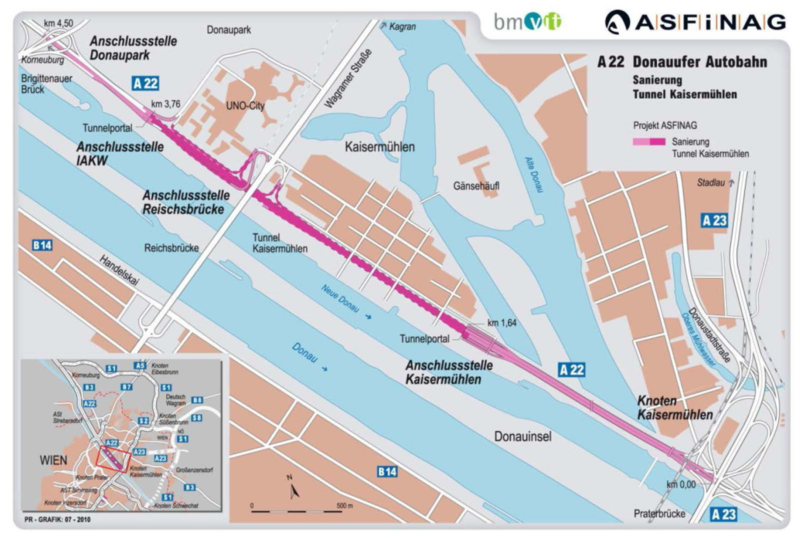 The current rehabilitation of the 2.2 kilometers long Kaisermühlentunnel on the A22 Donauufer Autobahn in Vienna is a quite tricky task. The works are performed during night and on the weekend in both tunnel tubes since September 2017. All works are performed under traffic which is quite challenging for the contractors. The consortium “ARGE A22 Kaisermühlentunnel” as general contractor for the electromechanical equipment installs new lighting, ventilation and safety equipment into the tunnel. By these measures Austria’s high level road operator ASFINAG improves the safety of Austria’s most frequented tunnel. 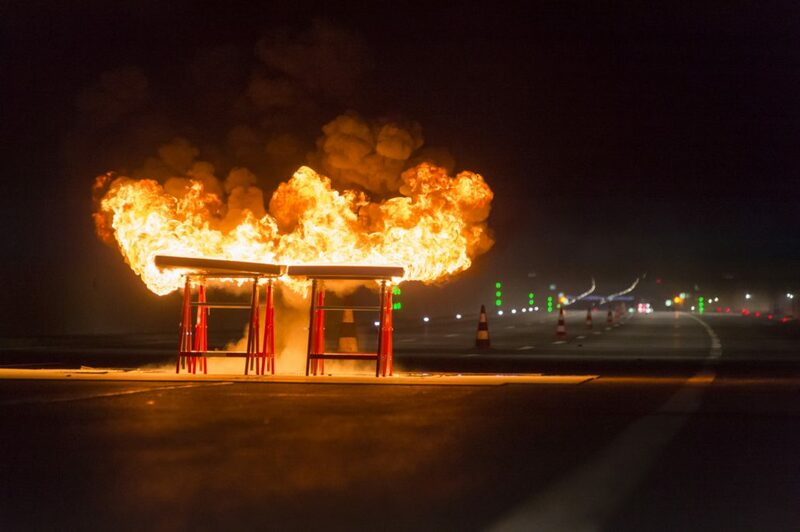 Recently fire tests have been performed to prove the functionality of the new ventilation system. The Kaisermühlentunnel is a two-tube, 2.2 kilometers long city tunnel with accesses, exits and collectors. It is located between the Kaisermühlen interchange and the Brigittenau bridge and was built as a noise protection tunnel in the years 1985 to 1989. From 1993 to 1996 it was extended by covering the Autobahn between the Marshallhof and the Donau City. 120,000 vehicles pass the Kaisermühlentunnel every day which makes it the most frequented tunnel in Austria. As the tunnel is a connection to the oil harbour Lobau a large portion of the traffic are heavy vehicles. The Kaisermühlentunnel is monitored around the clock by ASFINAG operators in the regional ASFINAG traffic control traffic management centre in Inzersdorf. On 26th June 2018 the functionality of the new ventilation system was tested by fire tests. 50 litres of fuel were set on fire in the Kaisermühlentunnel. This equals the intensity of fire and smoke generated by a burning car. The fire brigade tested four scenarios in the 2.2 kilometers long Kaisermühlentunnel. “All major Autobahn tunnels have to pass such fire tests”, says Andreas Fromm, managing director of ASFINAG, “these tests look spectacular however are essential for the safety during an incident”. The most important thing: latest after 90 seconds the tunnel control system has to localise the fire, automatically start the ventilation system and close the tunnel for traffic. The Kaisermühlentunnel is equipped with in total 40 jet fans. During a fire these jet fans transport the smoke out of tunnel in the direction of the traffic with a velocity of about two meters per second. This requires a sophisticated measurement of the air velocity and direction. “We are honoured that we once again equipped the most frequented tunnel in Austria. As for all other contractors the conditions of working only at night and under traffic were challenging for our staff. The more we are delighted that our systems – as usal – have performed reliably during the fire tests.”, says JES managing partner René Jung.